Five Unforgettable Experiences in Jerusalem! Jerusalem is a captivating city of ancient stories and peoples. Boundless in historical, sociocultural, and religious diversity revealed in the city's numerous architectural wonders, archaeological artifacts, and sacred sites, it is the inquisitive traveler's portal into the mysterious world of the Ancient Near East. It is difficult to fathom the magnitude of its historical breadth once you see with your own eyes such a tiny piece of the Middle East that has for inexplicable (and biblical) reasons endured countless upheavals, military conquests, resurgences and the intermittent (or should we say transient) windows of peace. There’s just so much to soak in; it gets overwhelming! So fellow wayfarer, are you on a quest to wander Jerusalem, capture unforgettable vistas, and experience all the various elements that make this city the wonder that it is? Here's a start. This article features recommendations for the best Old City rooftop view, an underground exploration beneath what's left of the visible Western Wall, a heart-wrenching genocide memorial experience at Mount Herzl, the eclectic Mahane Yehuda Jerusalem market, and an intriguing museum walk. I was able to do all that (and heaps more) without paying an exorbitant amount of money to tag along a tour group. While in Jerusalem, I embarked on days of both spontaneity and planned agenda all on my own, as I'm not a fan of paying for official tours. (The only ones I did were locally run, such as The Kotel organization and a walking tour of the Jewish and Christian Quarter in the Old City, which I didn't pay a penny - or rather, shekel for - since it's offered free.) You can certainly do the same! Inevitably, you find that, along the way some incredible people will cross your paths too. A gorgeous day in the Old City overlooking both the famed and contentious Dome of the Rock and the Western Wall. Possibly one of the most exceptional vantage points in the world - simply because you are looking on at a place borne through the echelons of history! Photograph: Yan Kamintzky. A typical day in the busy streets of New Jerusalem. Photograph: Janielle Beh. It’s refreshingly liberating to get around and stumble upon the various nooks and crannies of Jerusalem without a scheduled tour, which can really restrict your freedom to explore. If you’re adventurous, and you don’t mind walking (a lot); if you like getting on local buses and sheruts (mini-van taxis); if you love trying different foods and chatting with new people (thankfully almost everybody you meet on the streets will be able to speak pretty fluent English though the first two main languages are Hebrew and Arabic), you’re totally up for the challenge to impress some solo footprints around Jerusalem! I assure you that it will be a learning experience of a lifetime that encompasses culture, history, tradition, religion, and some exhilarating photography opportunities! A mesmerizing view of the Old City at dusk from one of the best rooftops in Jerusalem! Photograph: Yan Kamintzky. An Israeli friend of mine who works with Go Eco Israel took me to the best place ever within the Old City to see the marvelous Middle Eastern sunset overlooking the splendour of Jerusalem’s ancient rooftops, churches, and mosques. It was an inconspicuous place known as the Austrian Hospice located in the Arab or Muslim Quarter, a few paces from the famed Via Dolorosa route on the corner of Al-Wad Street. The quickest way to get there is via the Damascus Gate, which takes you into the Arab Quarter – probably the busiest and most chaotic part of the Old City. For a respite from the hustle and bustle, it's nice to escape into the quaint castle-like guesthouse. (Note that you need to ring the bell at the mahogany doors of the entrance before you speak into the intercom and request the reception to open it for you anytime between 7am to 11pm). The elegant entrance of the Austrian Hospice. Photograph: Janielle Beh. Established in 1863 by an Austrian-Hungarian pilgrim, the Austrian Hospice later served as the Austrian consulate in Palestine. Now it is a beautifully serene guesthouse that features a well-kept garden, a lovely café – try their Austrian strudel and hot chocolate! – and immaculate hallways. It is marked in the Lonely Planet guidebook as a ‘top choice’ accommodation in the Old City. While I didn’t have the chance to stay there due to the unrest that was also going on at the time in the Arab Quarter (it was during the 50-day summer war of 2014 that I was backpacking and volunteering in Israel! ), I was so glad that my friend took me to the rooftop of the hospice where I was mind-blown by the spectacular panorama it offered of the Old City. A poignant view on the rooftop of the Austrian Hospice where a cross stands with the Dome of the Rock in the background. Photograph: Janielle Beh. I went there three times to photograph the city scape, once in the afternoon, and two other times in the quiet tranquility of dusk just before the mosques began to sound their evening prayers. If you are exploring the Old City, make sure you stay long enough till sunset to see this! However, if you are a solo traveler and worried about safety, I do suggest that you either stay at the hospice for the night, or go with a couple of reliable friends or fellow travelers. In the evenings, it’s always good to be cautious of your surroundings and people who attempt to strike a conversation with you when you are wandering the Arab Quarter and the Old City in general. Other than that, you’ll have a smashing time and for the most part feel very safe, as there are helpful Israeli soldiers posted in every corner to maintain the security. A Jewish man prays at the Western Wall. Photograph: Janielle Beh. Even if you’ve never been to Israel, chances are you would have heard something of the Western Wall (Ha-Kotel, in Hebrew) or the Wailing Wall of Jerusalem’s Old City. It is considered one of the holiest places on earth for the Jews as it is part of the Second Temple. However, after the destruction of the Temple by the Romans in 70 AD, the Jewish people were once again exiled from their land. The Western Wall is what remains of the outer wall of the temple. The reason why it is thought to be so sacred is that rabbis of old have suggested that the divine presence of God had never left the wall, thus it has become a site of pilgrimage for all religious Jews and many around the world who are just curious to explore the indescribable aura of this ancient place. The wall now functions as a unique sort of ‘open-air’ synagogue where you will find people praying, crying, and lamenting at the wall (that’s why it was dubbed the Wailing Wall). Many also jot down a quick prayer and stick their prayer-note into the huge cracks between the stones. Visitors just need to take note that men and women are separated into two sections across the wall, and that women need to dress modestly with a head-scarf. The Western Wall Tunnels is what’s beneath the wall, a 488-meter long passage that runs the northern part of the wall. The only way to access this underground area of the Old City is to take a fascinating and insightful tour run by The Kotel (it cost me about $12 or less in Israeli shekels). It’s absolutely remarkable to see how the original walls were made of foundation stones that are so gigantic that some of them weigh several hundred tons and are the size of a bus! While it is cold and musty underground, it is absolutely worth the exploration as the Western Wall Heritage Foundation has helped to establish a proper route through the past and continuing excavations which unveil the wonder of ancient Jerusalem reaching back over 2,000 years despite years of ensuing battles and reconstructions. As you walk through these tunnels, you can only imagine Jerusalem's original grandeur, now half buried beneath the modern pavement. It’s an awesome and hair-raising feeling. Exploring the dimly lit Western Wall tunnels and massive foundation stones of the original wall. Photograph: Janielle Beh. The interesting architectural design of the prism-like Yad Vashem Memorial building at Mount Herzl, the Mount of Remembrance. Photograph: Janielle Beh. It was my second last day in Jerusalem after spending 48 days traveling around Israel, volunteering in a Galilean Druze village up north, and also spending a week in Jordan. I decided to spend the day reflecting and journaling – but I first wanted to visit the well-known Yad Vashem Holocaust Memorial at Mount Herzl. I didn’t regret taking half a day walking around the complex and exploring the grounds, which cover over 18 hectares of the Mount of Remembrance. It costs absolutely nothing to visit the museum and memorial grounds. Without a doubt, I learned and saw a great deal at Yad Vashem that both convicted and overwhelmed me. The History Museum, an impressive walk-through structure designed by the architect Moshe Safdie, takes about an hour to two hours of exploring, reading, and contemplating the devastating yet inspiring stories that cover comprehensive historical details, photographs and artifacts salvaged from the Holocaust events. The end of the museum features the circular Hall of Names, where the three million or so ‘Pages of Testimony’ filled out by family members of Holocaust victims along with profile photographs, are framed on the walls. A humbling moment at the Hall of Names. Photograph: Janielle Beh. Another part of Yad Vashem is the Children’s Memorial, where the 1.5 million Jewish children whose lives were lost in the Holocaust are honored by a flame that is reflected in hundreds of mirrors. As you walk through this dark and ethereal space, you hear the names of the children announced by hidden speakers. It is a surreal experience that leaves you with a heavy heart. When you exit the museum complex and visitor compound, you can take a pleasant stroll along the mountain where a marked path will lead you through park-like surroundings where you will notice trees that are dedicated to those who risked their lives to help the Jews who were trying to flee or hide from Nazis and their collaborators. Public transport tip: pay for a day ticket which allows you to get on and off the Jerusalem Light Rail on all stops. If you're going to Yad Vashem from New Jerusalem or the Old City (which you most likely would be), you can stop by the Mahane Yehuda market first for breakfast and then hop back on the light rail for another 10-15 minutes till it reaches Mount Herzl (that’s what the stop is called). Yad Vashem organises shuttle buses from the light rail to the memorial. But I reckon it's a pleasant and picturesque 10-15 minute stroll up to Yad Vashem (there will be signs to direct you towards Mount Herzl). One of my favorite photos taken in Jerusalem. This Jewish man happened to be strolling down the market center on the Sabbath day when everything shuts down completely in Jerusalem! I thoroughly enjoyed taking in the ghostly market scene on Shabbat. Photograph: Janielle Beh. To capture a different kind of photograph, I specially took a rather eerie walk through the infamous Mahane Yehuda market in Jerusalem on Shabbat (the Sabbath weekend when everything closes down). 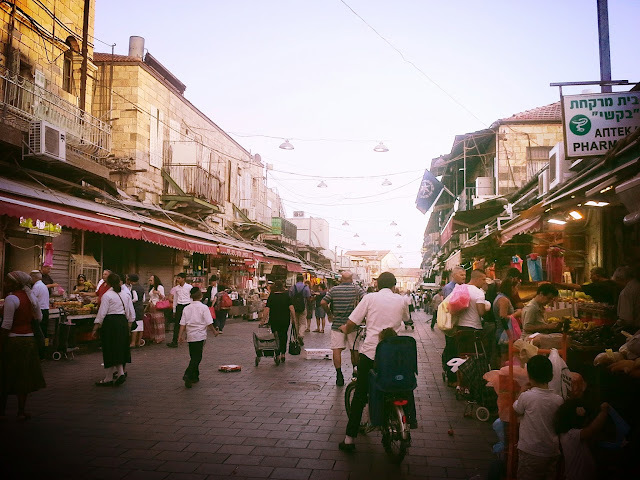 I love the above scene of a Jewish local walking through the deserted market, unlike the lively, colorful, and chaotic photos you get on the ordinary Israeli weekday. Of course, being a photographer who enjoys seeing life in a new culture from different perspectives, I'd suggest that you explore the market on both busy and empty days! The Shuk on Thursday, just before Shabbat the next day. You'll see many well-dressed orthodox Jewish locals doing thir grocery shopping for Shabbat dinner. It's a lively scene! Photograph: Janielle Beh. On a typical day, it's also quite an experience, as the bustling sounds and spice-laced smells of Mahane Yehuda market (also known as “the Shuk” to locals) is sure to captivate your senses and leave you intrigued at the sheer variety of fruits, nuts, cheeses, oils, vegies, spices, coffee and tea, local bread, pastries and biscuits, poultry, fish from the Mediterranean, and all sorts of Israeli-grown or produced foods. When I was in Jerusalem for both the first and second time in my 50-day trip, I visited Mahane Yehuda market to purchase dinner, lunch, and snacks on busy days, snap food and people photographs, or simply amble through the market in uncanny silence during Shabbat. Note that the price ranges of the cafes and restaurants are on par with Australian and European standards, so it is not a cheap eat-out for backpackers. But you can always buy fresh produce and breads or other market assortments to cook at your hostel. The market is only a short 5 minute walk from Abraham Hostel – probably the funkiest hostel in Jerusalem where I was staying – based at Ha-Davidka Square and facing the central street of the capital, Jaffa Road. Just remember that the Shuk is open only from 8 o’clock till sunset every Sunday through to Thursday, and on Friday it is open from 9 o’clock till 2, after which it closes for the remainder of Shabbat. A gallery featuring Ancient Near Eastern dressing over the centuries, Israel Musuem. Photograph: Janielle Beh. On one of my days in Jerusalem, I decided to walk from Ha-Davidka Square (where I was staying along Jaffa Road in New Jerusalem) to the Israel Museum in Givat Ram. It took me about 45 minutes using trusty Google Maps, as I didn’t want to take a bus. If you do take a public transport, you could take Bus 9 from the Central Bus Station in Jerusalem. But the walk was a nice one, as it led me through the quiet neighbourhood of Nahla’ot, Sacher Gardens, and the Knesset (or Israeli Parliament). A Jewish youngster in the usual dress-code commonly sighted in Jerusalem. I was on my way on a quiet morning walk to the Knesset and Israel Museum from Jaffa Road. Photograph: Janielle Beh. If you’ve got a week in Jerusalem, make sure you visit the Museum first! It’s the largest cultural institution in Israel and ranks as one of the top art and culture museums in the world that features Jewish Art and archaeological finds that date from pre-historical times and through ancient civilization. It’ll give you a great background of 5,000 years of history, art, culture, religion and archaeological artifacts right up to the modern century. After that, anywhere you go in Israel, you're pretty much set with basic knowledge of this incredible strip of land. It’s super cool to see the original Dead Sea Scrolls that were discovered in 1947 and are dated to the Bar Kochba Revolt in AD 132 – 800 scrolls in all – on rotating display at the Shrine of the Book. The archaeological section of the museum is also impressive and full of interesting items that span centuries of history and culture in the Ancient Near East. I spent a good five hours in the museum itself, but then I walked out and discovered there were more contemporary art pieces and monuments to see! An ancient Hebrew-inscripted stone tablet that is of floor-to-ceiling size! Photograph: Janielle Beh. The museum is also located opposite the Bible Lands Museum, which is a great place to learn about the biblical history of the Holy Land and its neighbouring civilizations dating from 6000 BC to 600 BC! However, a full day of museum-walking might be overdoing it to say the least, so you might want to break it up along your itinerary. I thoroughly enjoyed such days out, though. For me, it’s more like a ‘day off’ from the usual exploring, hiking, and wandering since it’s mainly indoors! Although, the hour walk back in the scorching Middle Eastern sun was a point of regret – remember how much I like walking? The grand Damascus Gate, Old City, Jerusalem. Photograph: Janielle Beh. Indeed, that's the price we pay to see the world, shake hands with its beautiful people, and walk alongside its natural wonders. So onward we tread, into the unknown day. Dear fellow wayfarer, you're welcome to shoot me a message if you've got any questions or ideas about backpacking and volunteering in Israel and Jordan! Keep Exploring, One Love.